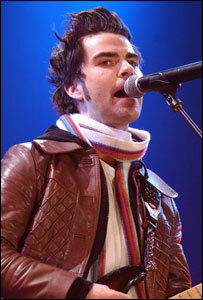 Welsh rock band Stereophonics have scored the UK's biggest download hit of the year so far. Their song Dakota topped the download chart for January to March, which contrasts sharply with the countdown of the best-selling CD singles. Tony Christie's hit (Is This The Way To) Amarillo was the top-selling single in shops for the same period - but failed to figure in the download list. The first Top 40 to include download sales will be announced on 17 April. The Stereophonics track was number one in the main singles chart last month but only made it to number seven in the quarterly CD sales rundown. Legal song downloads rose from 260,000 to more than 4.5 million in the last 12 months, according to the British Phonographic Industry (BPI). That is compared with 5.8 million singles sold in shops from January to March 2005 - down 14% from last year. The combination of physical and download sales in the Top 40 would lead to a "golden age for the single", BPI chairman Peter Jamieson predicted. The rise of legal download sites such as iTunes and Napster has meant total sales across all singles formats have risen by almost 50% in the last 12 months. The singles sales chart has been criticised in recent years for having an appeal that was "too narrow", Mr Jamieson said. "These figures suggest that the addition of downloads to the official singles chart will take the market to new audiences and broaden the appeal of the singles market." The BPI also said 96% of downloaders were male and 93% were over 25. The organisation has run campaigns to introduce independent record labels to the online singles market. In the US, downloads were included on the official chart for the first time in February.